So, if you caught my collaborative post with Emma from Summerfield Cottage and Us about our new planners, you'll know that we are stationery addicts and wannabe super organisers. And from the response we had, it seems we're not alone. Planning is a real trend right now and an obsession for some people, and Emma and I have well and truly caught the bug. That's why we've decided to launch our very own planner linky, to bring together posts and videos and all that is wonderful about us planner types. 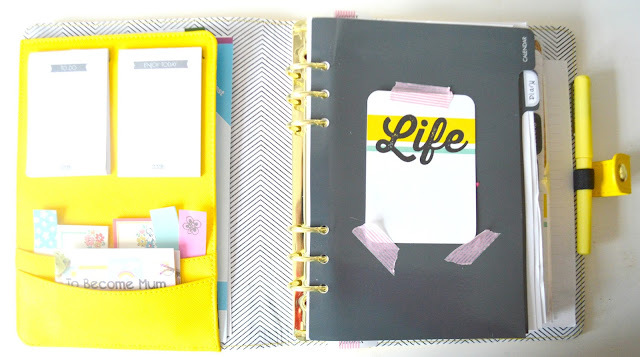 This weekly linky is for planner addicts, list queens and anyone who tries to bring order to the chaos of every day life. Feel free to link any posts, old or new. It's about sharing ideas and pretty plans and will tweet about every post that links up from our own Twitter accounts: @tobecomemum & @EmmaKershaw107. To start things off, I'm just going through my planner and re-jigging how I lay everything out. I like having month to view pages, for work, for home and for blog planning too. I then tend to use a week to two pages as my daily diary, for further notes and reminders. However, I'm finding I need some more space some days, so I've ordered some Filofax day to a page inserts. They need a lot of prettying up but I like the fact I can make each day different and I'm not so limited on space. I've kept things brief this week so you can catch up on our picking a perfect planner post and just get acquainted with our new linky. Looking forward to seeing your posts and videos and feel free to link up anything about the wonderful world of planning! oooh how exciting! I LOVE planning! I'm actually planning to get a yellow Kikki K soon myself, they look gorgeous! Do it! It's absolutely gorgeous and I've had so many compliments on it. I love your yellow Kikki K, it's such a gorgeous colour!